It’s an all-star flag waving salute for Armed Forces Day (May 19, 2018) featuring but-of-course a select Marx Armed Forces Training Center. This is the first time the two-story barracks has made its appearance in a playset on our pages, and shows just how exciting an environment the Marx playset can make. Marching through are Marx Marines, Air Force, Navy and the original Marx Army men, with accessories in abundance. Throughout this issue we’re saluting all the Armed Forces and take a short breather from extensive, all-in-one issue coverage of Marx’ finest sets for a bit more variety -- with lots of surprises like Timmee’s Ambulance Corps, Ideal’s Torpedo Firing Sub, Processed Plastic Air Force, a story on Wake Island, the first time our ground troops met the enemy in WWII; updates on BMC’s set configurations, an awesome update on MPCs hidden Jungle Hut in color; the Marx Civil War limber & Cannon set from David Schafer and Dr. Michael Cunningham, a salute to the Monogram GI (with fabulous store display! ); another awesome diorama from Ed Bodwell and our take on the BEST MILITARY TRAINING MOVIES! We’re having tons of fun with heavy armor this time, and so glad you took the time to join us. 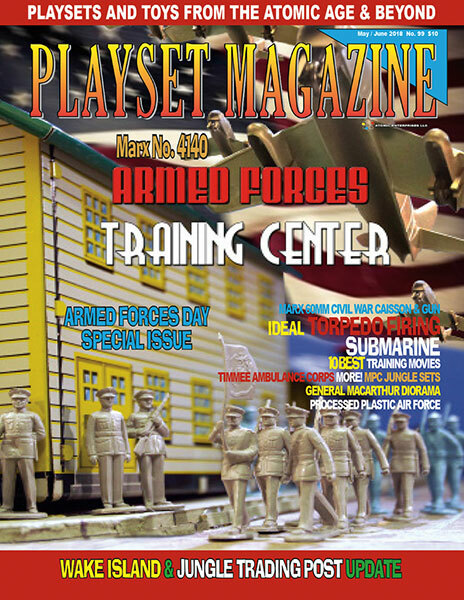 We’ll see you (get your flags ready) for this Armed Forces Special Issue! Issue 100 is nearly upon us and we have been working behind the scenes constantly to shape a most unique issue for you, dear readers!